Making sure I can embrace my art through the culture of society to get the same message across PEACE. Peace love & hope is the theme I want to work with. Creating murals in top locations around the country. This is a great way to use social media as a platform @ismailhussayn with other influences to make London and England beautiful with real ART. An Arabic calligrapher who creates stunning pieces of artwork that are innovative, creative and remarkable to look at. Taking the Arabic language and making it into artwork our calligrapher can create custom-made pieces of artwork that you can display at your event for all of your guests to see. Our artist can also create bespoke pieces on walls and to decorate venues to give a real authentic Arabic edge to any occasion. Also available as a live event artist our calligrapher can create pieces of artwork in front of your guests allowing them to take home stunning keepsakes that can be framed and kept at home. Perfect for corporate events, private parties, gala dinners and any occasion that desires a fresh and innovation Arabic calligrapher. In addition to creating bespoke pieces of artwork for events whether it be as a live artist or to decorate the venue with Arabic calligraphy, our artist also creates beautiful bespoke designs that can be used as home décor or presented to guests at your event. 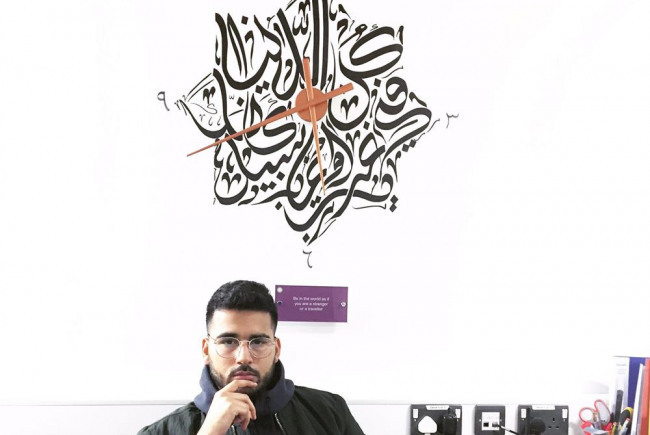 Having achieved a wealth of success with his artwork, this artist has produced pieces for huge names such as; Amir Khan, Paul Pogba and Maher Zain Nasheed as well as carrying out workshops at institutions from The University of Edinburgh to London Goldsmiths University, The University of Manchester Museum and more. Our calligrapher can be booked for live events, workshops and public speaking. Perfect for corporate events, private parties, exhibitions, Arabian themed events and any occasion that wants to bring Arabian culture to their event. A highly interactive and engaging service to offer at you event our artist boasts a fantastic dynamic to any occasion. Project Delivery Manager: Ismail Hussain The Project Delivery Manager takes legal responsibility for receiving and spending the funds raised and ensuring the project is delivered.